never too old to color: Ready for School? 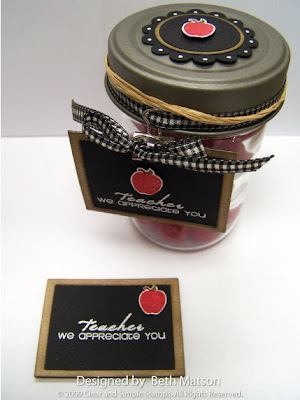 How about a magnet or a magnet attached to a jar of goodies? I used my Nestabilities to make a frame out of chipboard that I sponged with some Vintage photo Distress ink then attached a piece of black cardstock behind it to look like a chalkboard. I stamped the sentiment with Colorbox pigment Frost White and embossed it. The apple was stamped on white cardstock, cut out and mounted with dimensionals. If you want something more than just a magnet, how about clipping the magnet to a cute little jar of goodies? There are so many possibilities with this set. What a fantastic idea!!! The magnet would make a fabulous gift. These look wonderful! And I LOVE the name of your blog!